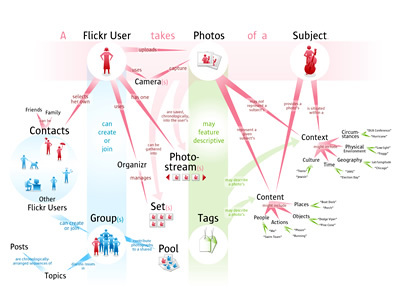 Bryce Glass has developed a series of delightful Flickr user model diagrams where one can easily understand the Flickr ecosystem and the full potential of the popular photo-sharing service. In October 24, 2005, Bryce posted this original diagram in his blog (Soldier Ant), which ended up becoming the first of a series of iterations. The latest version (v0.3) has several new elements, such as comments, rss feeds and blogs, but I still prefer the intact purity and simplicity of the original version (shown here). On his post on October 24, Bryce explains: "I've been doing some concept diagramming for work lately, and I've found myself enjoying it immensely. (...) However, since it's for work I can't share much of it. I did post some sanitized versions, with all the object-names obsfucated, but that just didn't seem wholly satisfying. So over the weekend I invested some time in a diagram that I can share with the internets: a simple Flickr user model (regrettably incomplete -- but I realized that if I tried to include the whole Flickr-verse that this diagram would go beyond labor of love and straight into excercise in folly)". 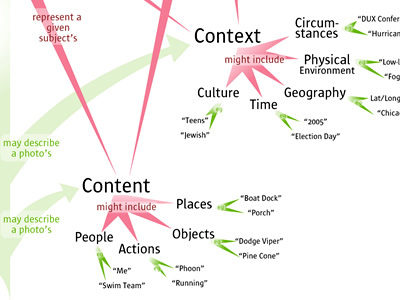 To see Bryce's latest version of the diagram click here.